“Tiwanaku: Spiritual and Political Centre of the Tiwanaku Culture” comprises the ruins of the capital of an important and distinct pre-Hispanic empire in the Andes. It reached its apogee between 500 and 900 A.D. The empire covered what now is southern Peru, Bolivia, northern Chile and parts of Argentina. The city lies in a valley on the alitiplano, 3,885 meter above sea level, close to Lake Titicaca. Its inhabitants had an unchallenged mastery of agriculture, including the farming of potatoes and quinoa, and the construction of terraced fields. The ancient city was mostly built of adobe, especially the residential buildings that have now faded away. For the ceremonial and administrative architecture lithic material was used. The capital once had between 70,000 and 125,000 inhabitants. 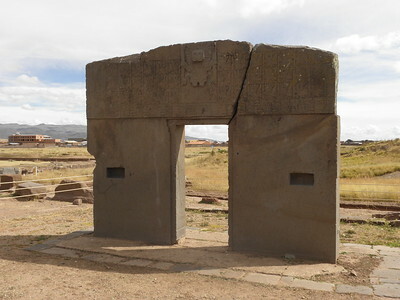 Tiwanaku lies 72km to the west of La Paz. It's a very fine trip to get out there: you'll pass the buzzing suburb of El Alto and the quintessential Altiplano landscape with lama's, indigenous Aymara women in traditional dress and mountain vistas. 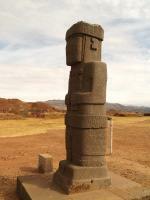 The Tiwanaku-site consists of 2 museums and the archeological site. The entrance fee for foreigners is 80 bolivianos (8 EUR), which gives you access to both museums and the site. The ceramics museum has a lot of pottery made by the Tiwanaku, as well as by their predecessors and the Inca. The "Lithic Museum" still only holds one piece - the Pachamama or Bennett Stele. It's a grand piece of work, a 7 meters high monolith, transported here from the center of La Paz where it had stood for years. It did not look as if other prominent findings were soon to join it in the "museum". Further development of both the museum and the archaeological site seems to have come to a stop. Our guide told us that there is a conflict between the local indigenous people and the Ministry of Culture how to proceed. The archeological site is spread out over a vast area, without many obvious highlights. The "pyramid" is just like a small hill. They hope to have it restored completely in 5 years, but that doesn't seem likely to me. Having visited so many archeological sites in Peru, for me it was interesting to see the links between the Tiwanaku and the (earlier) Chavin and the (later) Inca. For example at the Semi Underground Temple, my favourite spot of the complex. Here the walls are still (or again?) dotted with 175 stone heads, just like it once was in Chavin. At Chavin there is only one left in situ. In all, a site not to go out of your way for, but a nice enough addition if you'd like to see the whole spectrum of Andean pre-Hispanic civilizations. 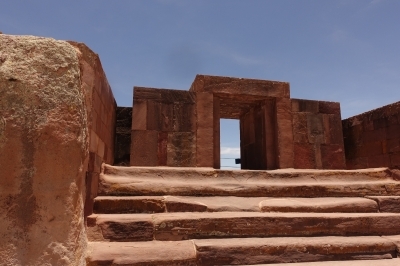 On what used to be close to the Southern shore of Lake Titicaca, you will find the ruins of Tiwanaku. Billed by some Bolivians as Bolivian Tikal, you will find a small pre colombian and pre inka archeological site whose history reaches back to 1500 BCE. For a long time the area was very fertile. But climate change and deforestation severely hit. Nowadays, the shores of Lake Titicaca are a distant 10km away and the area is covered by strubs and bushes. The site shows some nice stone works. The original pyramid is gone and hard to imagine based on the ruins that remain. As is often the case with pre columbian ruins the Spanish removed stones and used them for buildings in the nearby village, specifically the Spanish colonial church. On site several museums display excavation finds. The big stela is quite impressive. In the end, this is a fairly simple site and not much to dial home about. From La Paz you can do this on your own via colectivo. I can't confirm all the details of the how to, but I can confirm that there were colectivos waiting in Tiwanaku to take you back to La Paz. Due to being a bit time stressed and the organized tours being fairly cheap (below 20 USD) I opted for an organized tour. As is often the case most agencies seem to be selling the same tour. I booked via Diana Tours due to their speedy service. They were also just around the corner from my hotel. You can also do this while transferring from Puno to La Paz. I saw several tourist agencies in Puno offering the trip. However, you should always visit Isla del Sol and that to me seems like the better stopvover on a transfer ride. The site (or parts thereof) is part of the Qhapaq Nan nomination. I did not spot any concrete remains of the trails though. The archeological site has a piramide that covers more square meters than the one from Geops in Egypt, but is less tall. Total excavation is to be done in about 7 years. Interesting are the way the bricks are placed on the buildings (just like the Inca's used to do it later on), the ear-shaped loudspeaker, the interesting and very detailed carving on the sculptures and the faces on the wall of the Semi-subterranean Temple. Language isolate: It is assumed the language used by the Tiwanaku was Puquina, a language isolate that used to be spoken around Lake Titicaca. Max Uhle: In 1892 Uhle "published "The Ruins of Tiahuanaco in the Highlands of Ancient Peru," .... This extensive work is considered the first in depth scientific account of the ancient site of Tiwanaku Bolivia. Dubbed as another WHS: "The Baalbek of the New World" by American Archaeologist Ephram George Squier in 1877. Chapter XV of "Incidents of Travel and Exploration in the Land of the Incas"
Foreigner prices: Foreigners 100 bolivianos, locals 15 bolivianos.